THERE'S no denying there's a new kid in town when it comes to consumer tech devices and many believe it will soon usurp our smartphones. Venture capitalist and former Wall Street securities analyst Mary Meeker who specialises in internet trends and new technologies presented her 2018 internet trends report this week. Ms Meeker is highly respected and her yearly manifesto on the tech industry has become a much-anticipated annual event at the Recode tech conference. And this year was no different. Among her 294 slides was one which shows that 2017 was arguably the "year of the voice" as mainstream adoption of AI-powered smart speakers continued its rapid acceleration. 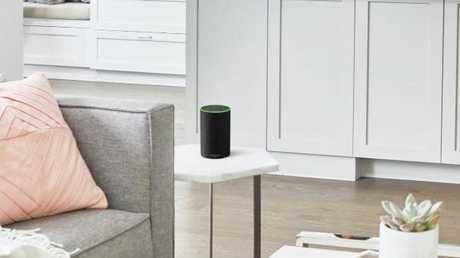 With speech recognition reaching 95 per cent accuracy in some cases, smart speakers are taking off. Amazon Echo Alexa heralds the start of a big shift in tech devices. Amazon was the first to market with the Echo speaker and is the industry leader. 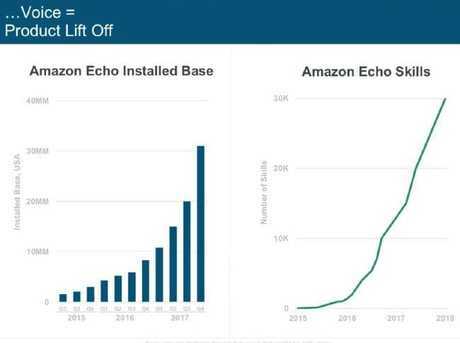 In the US, the number of the company's Echo installed base went from 10 million to more than 30 million in 2017. The slide below shows the rise in adoption through the four quarters of 2017, and on the right a separate graph shows the steep rise in "skills" possessed by the conversational device. Amazon Echo is the industry leader. In recent years, there's been plenty of insiders suggesting the frictionless world of voice controlled devices will render our smartphones as secondary devices. "I'm predicting that, by 2025, voicebots will become so prevalent, so powerful, and so useful in all areas of business and our personal lives that we won't need smartphones anymore," US tech journalist John Brandon wrote last year. Google's AI phone call demonstration a few weeks ago that troubled so many people is an example of the direction things are headed in. The company showed off how its AI voicebot can conduct phone calls with strangers to carry out tasks like booking a haircut. The idea is that pretty soon you won't have to open your phone, look up a restaurant and call to make a reservation. Rather you'll just tell your smart speaker to have the conversation for you. Google's Machine Learning Word Accuracy hit 95 per cent in 2017, which matches the threshold for human accuracy. There were plenty of other interesting takeaways to come out of Ms Meeker's talk. In terms of average selling price of smartphones, Ms Meeker's data shows a decline despite the introduction of the more expensive iPhone X and other high-end Android phones like the new Samsung Galaxy. The cheaper average is in large part due to a rise in more affordable Chinese smartphone manufacturers. Internet usage remains pretty solid as people are more addicted than ever. In the US, the average adult spends 5.9 hours per day on digital media, up from 5.6 hours in 2016. However because about half of the world's population is now online - about 3.6 billion people - the rate of internet user growth is slowing as we approach saturation. While Silicon Valley is the epicentre of the tech world, China is catching up to its US counterpart. 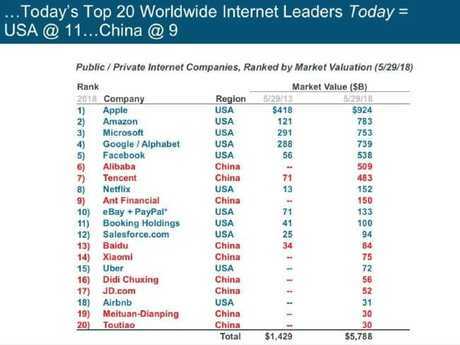 When it comes to the top 20 biggest tech firms in the world, there were just two Chinese companies on the list five years. Now there are nine. The slide below show's China's rising presence among the tech elites. Some experts believe China will obtain AI parity with the US in five years. New technologies are being adopted at a quicker rate and disrupting traditional industries mush faster. It took about 80 years for Americans to adopt the dishwasher while the consumer internet became commonplace in less than a decade. Usability improvements to many tech gadgets are based on data, which creates what Ms Meeker called a privacy paradox: internet companies make low-priced services better thanks to user data. But both regulators and customers want to ensure that data isn't used improperly which is easier said than done at times. "It's crucial to manage for unintended consequences," Ms Meeker said in her presentation. "But it's irresponsible to stop innovation and progress."